Collagen is a major protein component in our body which makes up 70% of the skin. It maintains the strength and flexibility of not only our skin, but connective tissue, ligaments, bones, joints and muscle, tendons, gum, teeth, eyes, blood vessels, nails and hair. As we aged collagen production slows down and loses its firmness and radiance. Sign of aging such as enlarged pores, wrinkles, age spots, blemishes, dryness and sagging all reflect the body's loss of ability to produce and maintain healthy collagen production. FINE Collagen is derived from fish peptides, known for its small molecular size that makes it compatible to the basic components of the body's own collagen: it helps to replenish its own collagen supply and boost collagen cell turnover, assisting the body in making younger-looking and firmer skin. 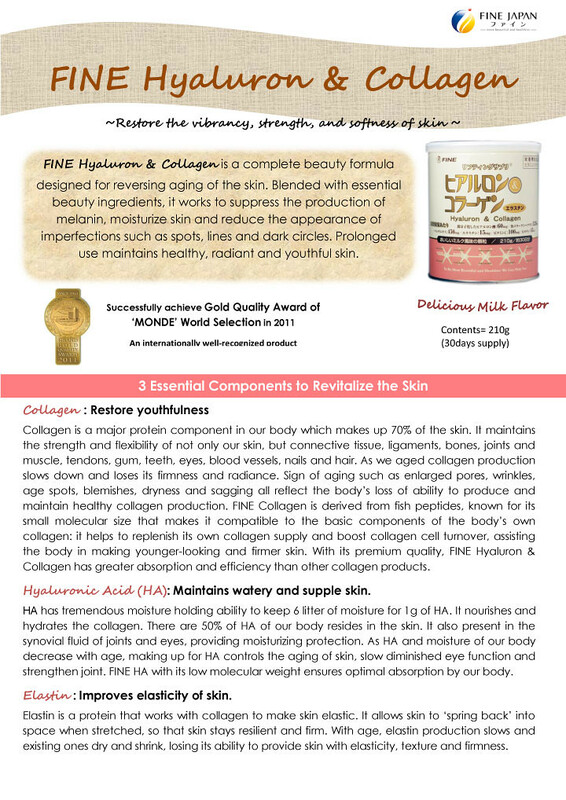 With its premium quality, FINE Hyaluron & Collagen has greater absorption and efficiency than other collagen products. HA has tremendous moisture holding ability to keep 6 litter of moisture for 1g of HA. It nourishes and hydrates the collagen. There are 50% of HA of our body resides in the skin. It also present in the synovial fluid of joints and eyes, providing moisturizing protection. As HA and moisture of our body decrease with age, making up for HA controls the aging of skin, slow diminished eye function and strengthen joint. FINE HA with its low molecular weight ensures optimal absorption by our body. Elastin is a protein that works with collagen to make skin elastic. It allows skin to "spring back" into space when stretched, so that skin stays resilient and firm. With age, elastin production slows and existing ones dry and shrink, losing its ability to provide skin with elasticity, texture and firmness. Pearl Coix is one of the Chinese herbal medicines taken for years and has been loved as Hatomugi tea by many people. It has been used in Japan over 30 years for its detoxification, antioxidant and beautifying properties. It is a beauty ingredient for clear, fair and luminous skin. 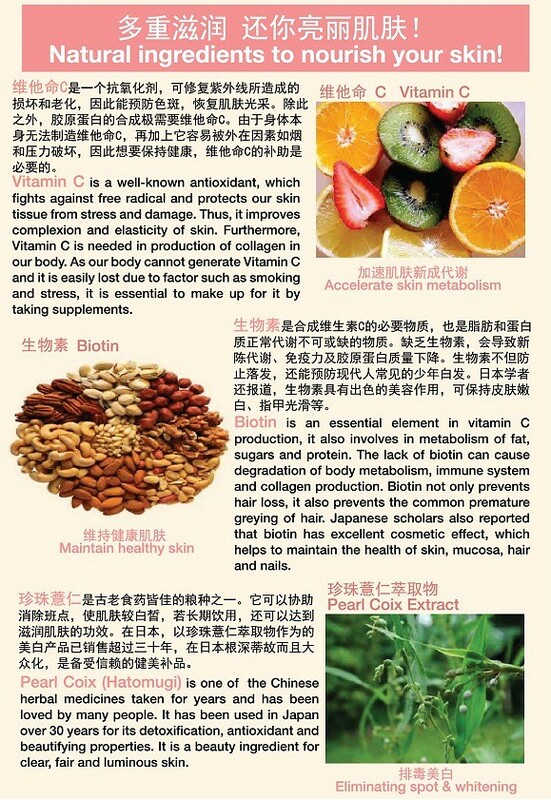 Biotin helps to maintain the health of skin, mucosa, hair and nails. It involves in metabolism of fat, sugars and protein. It also helps to ease certain skin disease such as eczema and dermatitis. Vitamin C is a well-known antioxidant, which fights against free radical and protects our skin tissue from stress and damage. Thus, it improves complexion and elasticity of skin. 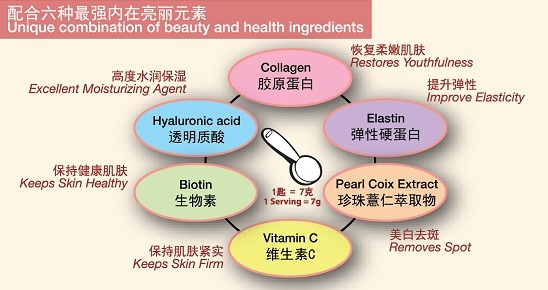 Furthermore, Vitamin C is needed in production of collagen in our body. Without it, we might probably just get a quarter (1/4) result of it. As a dietary Supplement, take 7g (1 spoon attached in can) with 180 to 240ml of water or your favorite drink such as fruit juice, red tea or chocolate. You may also consume it with desserts such as yoghurt and ice cream. Take once or twice a day for its optimum nutritional benefits. *Could be consumed with flu tablets. Points you'll get for this item : +188 pts HiShop Points may be used as credits to offset future HiShop purchases. Fine Hyaluron & Collagen 210g is good but due to this product is in powder form. Less convenient when drink it. It tastes like milk. Item received in good condition, good and prompt service during delivery. This is my second purchase and I really like to shop here because they provide cash on delivery which is very convenient for me.